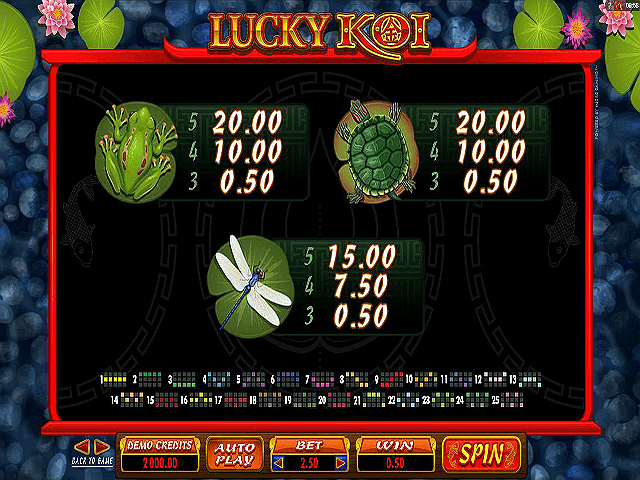 If you’re keen to take a break from elaborate online slots with their buzzing graphics, dizzying animations and rocking soundtracks then Lucky Koi might well be the game for you. With a gentle Far Eastern theme that’s as calming as a Japanese Zen garden, this five-reel, 25-payline video slot affords a truly laid-back gambling experience. 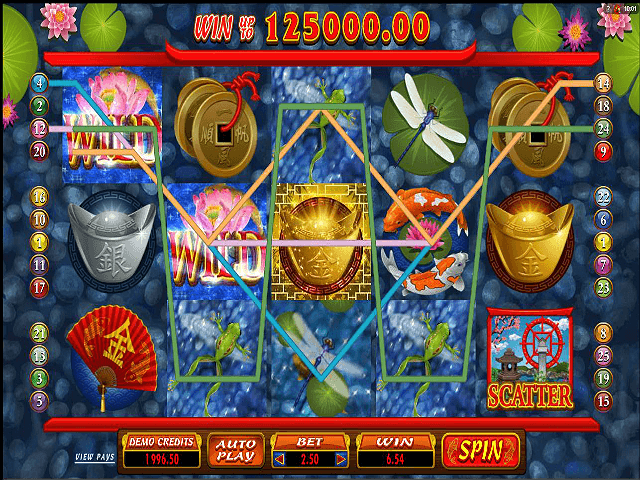 As you’d expect from a Microgaming-powered title, the graphics and animations utilised in Lucky Koi are nothing short of superb. The reels sit atop a beautifully rendered water garden where the eponymous fish swim beneath a shimmering surface dotted with lilies and lotus flowers. The gentle oriental score playing in the background tops off the relaxing, Zen-like vibe perfectly. 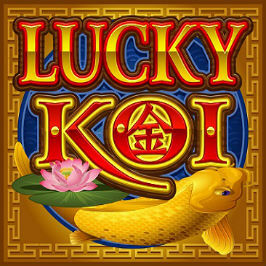 The Lucky Koi online slot offers a non-progressive jackpot of 125,000 coins and can be played for as little as 25p per spin. The maximum possible wager is £25 per spin. There’s a Max Bet button for the high rollers, as well as an Auto Play feature that’ll spin the reels up to 1,000 times automatically for you. The RTP is pretty good at 96.4%, although this can zip up to a significantly more favourable 97.5% during the free spins feature. You’ll get anything from ten to 30 free spins, with a potential multiplier of up to 5x for any wins you nab. Moreover, the wild becomes an expanded wild for the duration of the round, affording you more chances to win. Landing three additional scatter symbols triggers the round again. It’s worth noting that the free spins mode can be very lucrative if you play it smart. 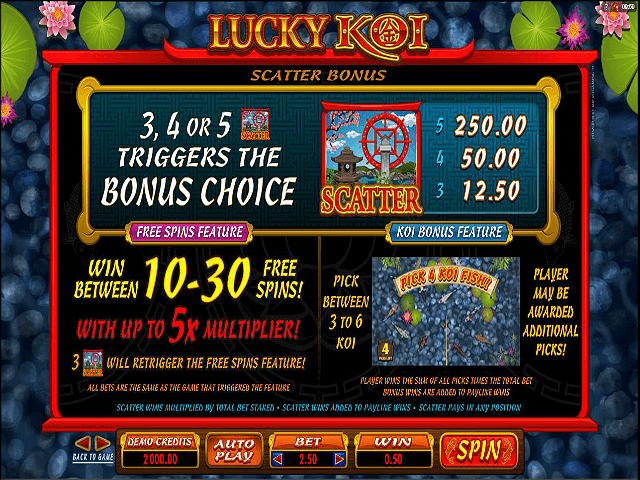 The trick is to hit a random multiplier on every spin (2x to 5x) – the higher the multiplier, the bigger the cash prize. Employ this strategy and you can win as much as 1,000x your stake. This is a fun sub-game which gives you the option of choosing between three and six Koi fish from a pond of 12. Each one is worth a bonus amount which is paid out as an instant cash prize when the selection process is over. 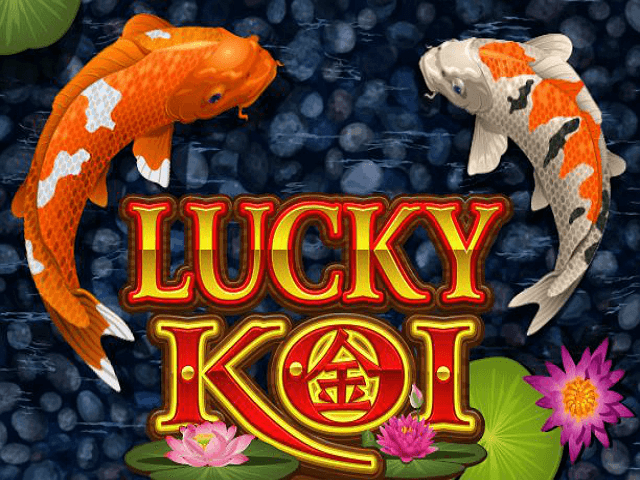 Lucky Koi, with its serene animation and soothing soundtrack, is certainly a great online video slot to play on those days when you just can’t be doing with ‘flash, bang, wallop’ offerings. The two bonus games are very enjoyable in their own right, too. Whether it has enough in the tank (pun intended) to keep you interested in the long-term is perhaps something you’ll have to ask Confucius about. If you like Lucky Koi - You'll like these slots too!